Take a good look at this painting. It takes in the whole world: the city, the country, the ocean, and the sky. It shows you all that is possible in this world. And yet, the city would not exist without the lowly peasant: the one who tills the soil and brings food to your table; of course, the shepherd and his sheep who feed and clothe you; the fisherman who brings you succulent seafood, and finally, the sailor who handles the ships on violent seas, who helps your commerce, brings you spices from foreign lands, and sells your plentiful merchandise that you do not need. I know you do not trust the world around you, for you have built this citadel offshore, to ward off would-be attackers. You better rebuild it for it is in disrepair and looks almost like a rock. I myself feel more secure. I grow my own food, and am quite happy to have a modest house. I have a wife and children to come home to, and a fire to keep me warm. Most important, I do not worry where my next meal in coming from. When my wife puts the children to sleep, I go outside, lean against the house and play my flute. I look at the moon and the stars and I own all that I deem precious. I was very aware of what was happening in Europe at the time of World War II. I had lived in England with my mother, who was English, for several years before the war started. That’s probably one reason I joined Naval Intelligence and served there for almost three years. Throughout the war, my family would send parcels to my relatives abroad. 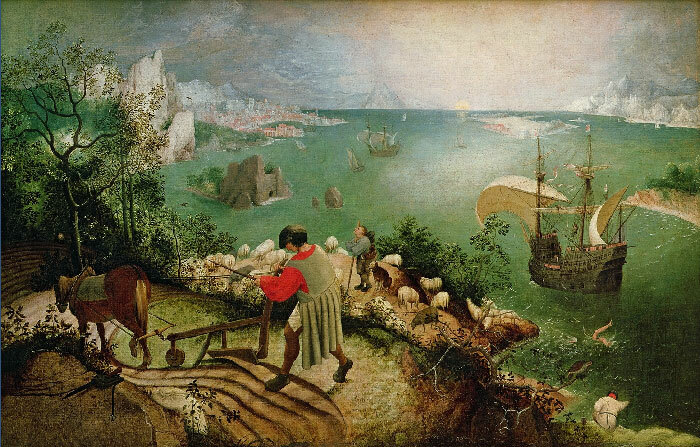 I’m afraid that I was not like the men in Brueghel’s painting—the farmer, the shepherd or the fisherman—who appear unconcerned, indifferent toward the poor soul who has just fallen into sea. Even as a child, I was aware of how my father (an orphan who with money he won in a lottery in his native Sweden came to this country, put himself through school and became an engineer) suffered when he couldn’t find work during the Depression. I—who held my father in high esteem—felt his pain keenly. when I was nine or ten. as a present from my brother and his friends. gave coupons with each purchase. a pair of roller skates!! six-family duplex on level land. Just a short distance away, it became downhill. how to stand and how to roll. then started down the hill. move my feet or anything. I DID NOT KNOW HOW TO STOP! a little twig that acted as a break. Down I went, got many scrapes and bruises. nailed that board to a wooden box. I think this painting by Pieter Brueghel is a very peaceful one, filled with lots of people and animals who appear preoccupied. Not only is the shepherd not paying attention to the young boy falling into the sea, he’s not paying attention to his sheep. The farmer is focused on driving his plow, planting seeds. In the background, it appears someone is swimming in the water so the season may be spring. There are many boats in the harbor. All in all, it looks like a beautiful day. As a kid, I hated having to wear my two older sisters’ hand-me-downs. There were two dresses a rich aunt had bought them that I especially hated. Each had ruffles on the bottom. Why not take a pair of my mother’s scissors and cut holes in them? It seemed like a good idea at the time. The moral to the story? My mother made me wear both dresses with the holes in them. This painting brings to mind a book I’ve been reading about the early Americans. I can visualize the pilgrims landing at Plymouth Rock, New England’s rocky coast. Like here, their boat was in the harbor. They were starting a new life in America. It was a windy day in October. They started to plow the fields to plant. The sheep were there with their shepherd. In the distance, the leaves on the trees were turning brown. Early America was being settled. The Indians helped the early settlers in many ways. They were taught how to plant corn, how to use a bow and arrow to hunt. It was interesting to read about the hardships the early settlers went through. Years ago, my station in life was being the second mother to my best friend’s children. I firmly believed in the adage of unconditional but tough love: Mean what you way. Say what you mean. Never back down. There have been many times I’ve put that adage into practice with my three “step-children.” One evening, my mother, father and I were enjoying a little television when we were startled by a heavy thud—the sound of little feet jumping off the bed and dressers—from the upstairs bedroom. Father gave a sharp reprimand. It wasn’t long before another thud followed. Then more scolding. Then, more thuds. Finally, Father yelled: “If I hear any more racket, I’m going to send up Aunt Grace.” And for the rest of the evening: total silence. In 1938, I was living in Neuilly-sur-Seine, outside of Paris, with my mother and sister. Father had sent us there in 1936 while he settled affairs here, stemming from his bankruptcy during the Depression. The plan was for all of us to eventually move to Lithuania, my father’s birthplace, and begin a new life near his mother and father. While in France, I attended public school, learned to speak French, and made new friends. My sister Grace, who was 10-12 years older than me had hoped to apply to college there. Her application was turned down and she ended up finishing her teaching degree years later at Douglas College in New Brunswick. Both she and I became teachers because Mother felt it was a solid profession for a young woman to have. Though we both chose the same profession, my sister and I were different in many ways. Besides the gap in our ages, she was a mamma’s girl and I was a daddy’s girl. I’m sad to say we were never the best of friends. By 1938, war had broken out in Europe. I was eight at the time and very frightened. Mother decided it was no longer safe to stay in France and wrote Father to say that we should leave the country immediately. Within days, someone from the U.S. Embassy in Paris evacuated us to a ship for our return to the United States. I recall spotting my father in the crowd gathered at the dock in New York City. I was the first one off the boat to greet him. I wanted him to pick me up and give me a big hug. I was ever so glad to be home. Hardship and suffering have made me more tolerant of others, more compassionate of another person’s pain. It’s helped me understand what they must be going through, because I went through it myself.